Mac's Gold is the oldest and most popular of the Mac's range. 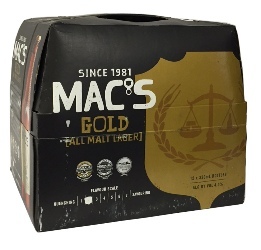 Brewed in New Zealand Mac's Gold has a light fruitiness with hints of citrus and sweet malt. The subtle mid palate bitterness of the hops is balanced by a smooth, delicate caramel sweetness that leaves a crisp finish and refreshing aftertaste. First made in 1982, the local Nelson hops used in brewing the beer gave it delicate aromatics and quickly made it the sought after drink, that it still is today. Fell in love with this beer on my first visit to Napier in 2013 been looking for an importer ever since, its like nothing else I've ever drunk. Full flavoured but light in body great malty finish yummy! A great beer served chilled on a warm summers day! I fell in love with this in New Zealand - Thank goodness there's a UK importer!